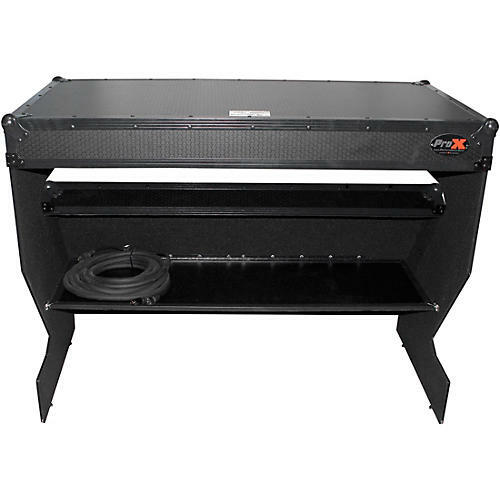 The ProX Z style DJ table is easy to set up, quick to collapse, and amazingly portable. It's constructed with the ProX signature series certified 3/8 inch Honeycomb Digital design plywood, which provides a unique look. The table measures 48" x 25" featuring plenty of room for your latest controller and equipment and is the perfect height of 3ft keeping all of your gear within immediate reach. It can handle up to 200 lb. evenly distributed. The low profile Penn Elcom casters, which are built to last, makes transporting your Z table effortless. It's manufactured from all of the best industrial strength quality materials you expect from ProX Cases.